I hope all my fellow Canadians had a wonderful Thanksgiving. As I write this I'm currently in a food coma watching Hocus Pocus with the family. Thanksgiving was exactly what I had hoped for, full of family and food!! I started the baking yesterday to have my special cake all set for today! Here is what you will need.. 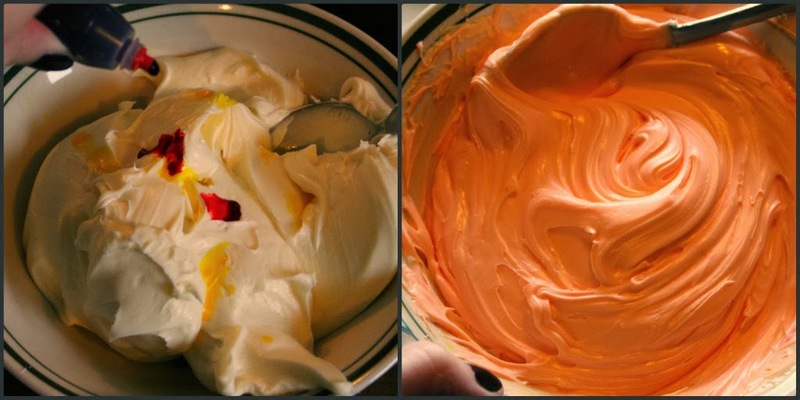 I didn't have orange food colouring so I mixed the yellow and red I had. More yellow, less red. Once the two pans of cakes had baked and cooled, I made sure to put icing in the middle and once together, smeared the rest of the icing all over the cake. This was the end result. I actually had less candy corn on the cake originally, but had some left overs and decided to go all out. Baking while watching Casper made for a wonderful Saturday night. Thanksgiving Monday I started the day off with homemade Vegan Pumpkin Hot Chocolate. Finish it off with some festive mugs and whip cream and you are all set. I really enjoyed this treat. I'm so glad I found this recipe because it will be a go to for chilly fall nights. Thanksgiving would not be complete without pumpkin pie and whip cream. The other treat I was going to try out would have been these mini pumpkin pies. It seemed a little bit more labor intensive, so I opted for a store bought pie instead. Another recipe I found on Pinterest was Warm Apples with Ice Cream. First cut the top of the apples and hollow them out. Coat them in cinnamon and brown sugar. Place them in a butter filled pan and let them warm and soften. I hope everyone had a food filled day. For anyone that has yet to celebrate Thanksgiving, I hope these treats can inspire you to create them yourself for whatever occasion you choose.